The next stop on my children’s book tour is this children’s picture book by well-known author Lemony Snicket. First, a little something about Lemony Snicket, probably best known for his YA books, A Series of Unfortunate Events. I loved this series when I was a teenager although I will confess to being more than a little disappointed by the final book. Anyway, since my teenage years I have not read anymore of his work and it just so happened that he popped up while I was looking for books to include on my children’s book for adults feature. I stumbled upon The Dark browsing picture books on Amazon, and when I saw the cover, with the tiny, fragile image of a child staring hesitantly into the mouth of darkness at the top of an endless flight of stairs I knew I needed it. It looked exactly like the kind of children’s book I was searching for, heavily illustrated with a dark touch. The cover alludes to a story just dark enough to give a child a bit of a thrill while cuddled up in bed, but not so much that a caring parent can’t then turn out the lights without an internal dread of being awoken by a nightmare induced screaming sprint to the master bedroom and the sleepless night that is sure to follow. Intrigued, I decided to give my old friend Lemony another chance. 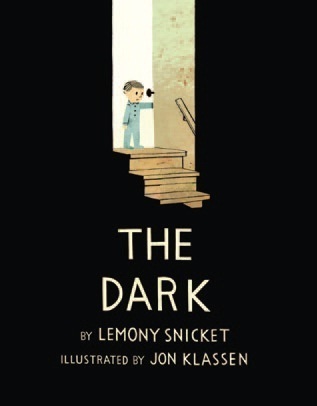 The Dark is about a little, pyjama-clad boy named Laszlo, who ‘was’ afraid of the dark. The pages of the book take you on a journey with Laszlo through the darkness of his house path is lit only by a triangle of light shining from his flashlight. He follows the voice of the dark, a deep, creaking, rumbling voice, which calls out to him. The design of the book is absolutely stunning. 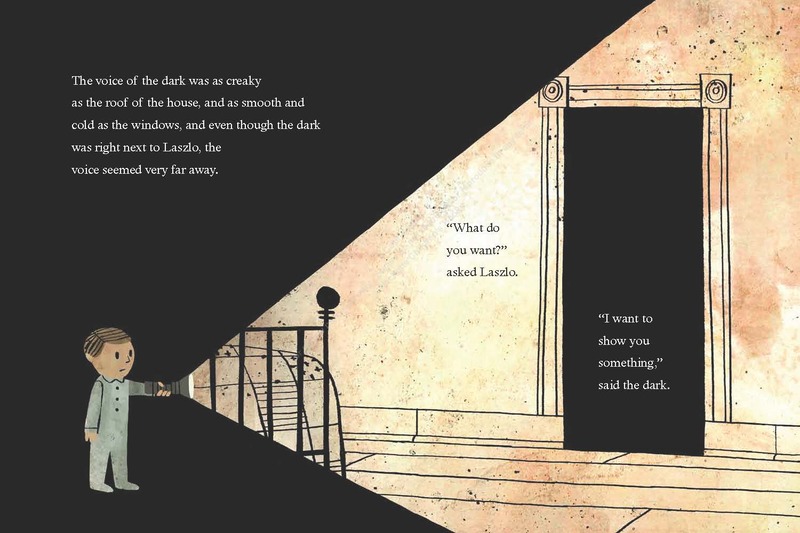 Klassen’s illustrations, transposed onto dark blocky pages emphasises the light and dark in Laszlo’s house and make for an amazing visual journey. 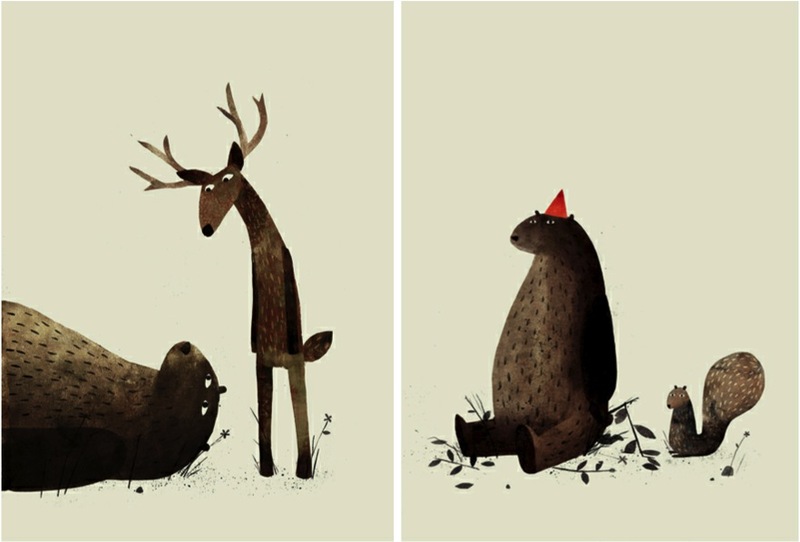 The illustrations are simple and mysterious, alluding to more while showing the bare minimum. Klassen’s work is beyond stunning and in some ways speaks more volume than the words themselves, take away the text and you still have an epic visionary tale. At its heart The Dark is a simple, yet inspired book. The story of a little boy and his somewhat unusual experience which helps him to get over his fear of the dark. The moral of the story is that there is nothing to be scared of – the dark can’t hurt you. I absolutely love this book. The story, the language and the illustrations combine to make a really beautiful and impressively unusual children’s book. While it may seem that the book is a little too dark for some children, I think a parent can judge for themselves whether their child will revel in the thrill of a child tiptoeing through a house on a terrifying midnight adventure. I loved this kind of stuff when I was little, and I know my nephews would lap something like this right up. It also has a great moral to it, which will can easily be used discuss being afraid of the dark with your own little Lazslo, you never know maybe he’ll finally let mummy and daddy have their bed to themselves again. That said, if your children are particularly sensitive, and likely to be upset by a slightly dark book, you might want to think twice before buying them this one. I have a friend who is rather into children’s books, so when I had read The Dark I took it round for her to marvel at. ‘I love this book’ she beamed as soon as I pulled it from my bag. I wasn’t the first one to show it to her. I was gutted. But my disappointment was short lived. ‘You need to read this one’ she said, thrusting another books into my hands. 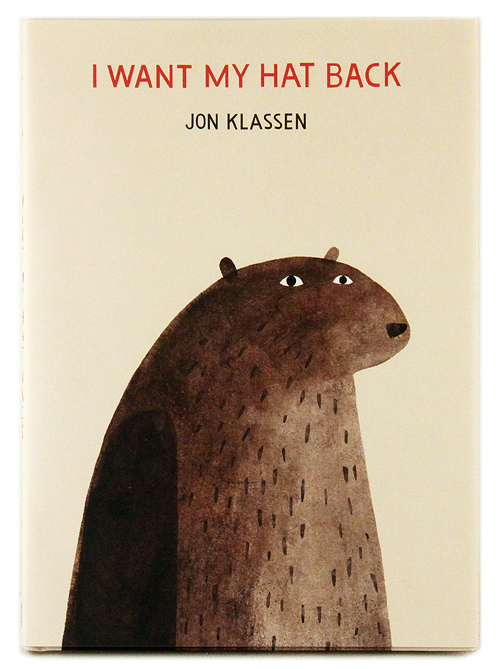 The book in question was written and illustrated by Jon Klassen. I gave it a read and enjoyed it so much that I have to give it a little mention here. A bear has lost his hat and he wants it back. He travels around asking all of the animals he passes if they have seen his hat, most of them say no, some are outraged to have been asked, one doesn’t know what a hat is, and others have been far too busy to look out for missing hats. The bear feels dejected, he lost his hat and he will never get it back. Until he realises, that he has seen his hat after all. I Want My Hat Back is easily one of the most hilarious children’s books I have ever read. I was literally, and I mean literally in its literal sense, doubled over laughing when I read this book. The kind of laughter that brings tears to your eyes and makes you struggle to draw breath. My boyfriend, unamused by the scene I was making in our otherwise empty living room, tutted and I told me to get over myself. I stuffed the book into his arms; he needed to read it for himself. A few moments passed before a loud ‘HA!’ from the other side of the sofa let me know that he approved. Some people have said they don’t think the book is suitable for children, I think these people need to lighten up a little. The book is great, it’s the perfect example of a children’s book that can actually be appreciated by an adult, without having to be overly long, or complicated. The story is short, simple, brilliantly illustrated, and absolutely hilarious. I challenge any adult to not appreciate the tragic-comic masterpiece that is I Want My Hat Back. Many thanks to Hachette Children’s Books for sending me a free copy of The Dark for review purposes.